Substantial remains of thirteenth-century castle of Hubert de Burgh, raised on an earlier motte. It was later remodelled by the house of Lancaster. 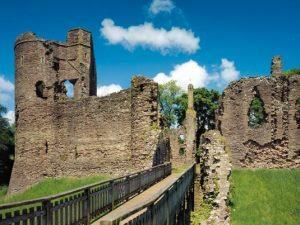 Grosmont is on the B4347, 10 miles (16.1km) north-west of Monmouth (or north-east of Abergavenny via the A465). Entering the village from Monmouth, church on left and footpath to the Castle on right. Continue by road past the Angel Inn and car park signed on left.